Welcome to Part 2 of my little series on the similarities between Halloween and Christmas. Here's another ghost of Halloween past. 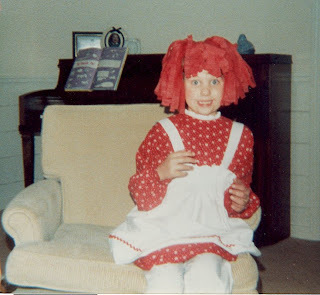 You've got to admit that the red crepe paper Raggedy Ann wig is pretty awesome. There are several more similarities between Halloween and Christmas. Neither is mentioned in the Bible. Christians have opposed both holidays. European immigrants brought their Halloween traditions to America during colonial times, but most of New England refused to celebrate the day due to Puritan influence in that area. Many Christians also oppose the celebration of Halloween today. At the time of the Reformation, the Protestants refused to celebrate Christmas because they considered it a holiday concocted by the Catholic Church. The Puritans also opposed the celebration of Christmas and often with good reason. In England, people would dutifully go to church and then celebrate the holiday in a drunken, Mardi Gras like atmosphere. In 1645, Oliver Cromwell and the Puritans wanted to rid England of her decadence and Christmas was canceled until the reign of Charles II. The American Puritan settlers did not practice Christmas and the holiday was actually outlawed in Boston from 1659 to 1681. Anyone showing Christmas spirit would be fined five shillings. The American incarnations of each holiday bear little resemblance to the original religious celebrations. Interestingly, the American incarnations of each holiday were not embraced out of religious convictions, but rather because of their supposed benefits to the community. European immigrants brought many of their Halloween customs to America and the flood of Irish immigrants in 1846 helped popularize the holiday. Americans began to dress up in costumes and go door to door asking for food and money. This practice waned during the nineteenth century when the holiday was primarily celebrated with parties in homes, but became popular again between the 1920's and 50's. By this time, Halloween had lost most of its religious undertones and became a secular and community centered holiday directed primarily at children. Today most children have no concept of the religious origins of dressing in costume or trick or treating. The celebration of Christmas in America was not widespread until the 19th century (it wasn't even a federal holiday until 1870) and the celebration of the holiday was greatly influenced by two authors: Washington Irving and Charles Dickens. Both wrote Christmas stories which emphasized charity, goodwill, and kindness to the poor and evoked old English Christmas customs. This struck a chord in a time of great class conflict and the Victorians saw the benefit of celebrating the holiday. Each holiday has its own heartwarming Peanuts special involving Linus discovering a great truth. All right, this isn't really relevant. But it's true. Check back on Monday to find out the problem with nativity sets.